At last weekend's Icons of Hollywood auction in Beverly Hills, Ca the Delorean featured in Back to the Future III sold for an impressive $541,200. It may seem like quite a premium to pay but of the seven movie cars used during filming of the Back to Future movies this Delorean is one of the three still known to exist. Of those three this is the only one held privately. 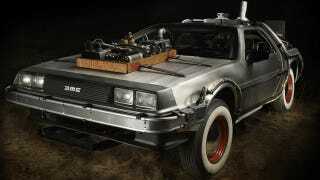 Accordingly if you couldn't live without an authentic Back to the Future Delorean this was your chance. We're holding out for a functional hoverboard.